The Doctors Revisited - JON PERTWEE | Warped Factor - Words in the Key of Geek. Andrew Jero continues his daily look back at each era of Doctor Who. Today it's the turn of the third Doctor, Jon Pertwee. 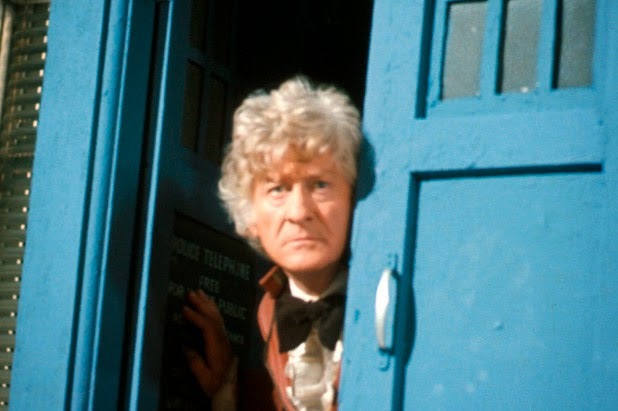 In the fifth in my series of articles looking at all the Doctor's eras, we will focus on Jon Pertwee, the Third Doctor. As usual I will take a look at two examples of his better stories, two middle of the road stories and two of his worst stories. Starting with one of the best stories from one of the best ever seasons of Doctor Who, that would be Doctor Who and the Silurians from season 7. It's a story that ranks at number 6 amongst my all time favorites. It's easily one of the most interesting ideas for a story that Doctor Who has ever presented, and is full of twists and turns which help it to feel unlike anything else we've ever seen on the show. The score is superb, as is the design of the Silurians - one of the best looking monsters in the show’s history. At 175 minutes it's the fifth longest ever Doctor Who story, but it's also one of the paciest. Jon Pertwee is on top form here, and rewatching it today it is surprising just how much it still holds up. The final story of season 7 story, Inferno, saw the show delve into the realm of parallel universes for the first time, a concept which. although repeated, would never be used anywhere near as well again. It's another 7 part adventure but Inferno manages to keep the audience engaged throughout with the switching of universes. Seeing the events of the story play out in a parallel universe and then watching them unfold in our own is one of the most creative and well executed ideas in Doctor Who. 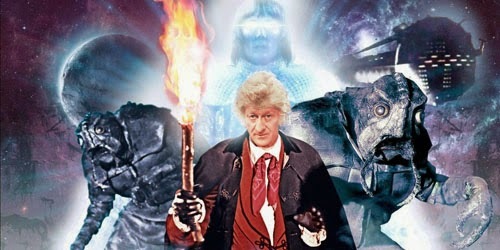 The entire cast is on top form, with the best performances from Jon Pertwee, Caroline John and Nicholas Courtney as their respective characters and opposites (sans Jon Pertwee), and Inferno also provides us with one of the best performed scripts of the era. 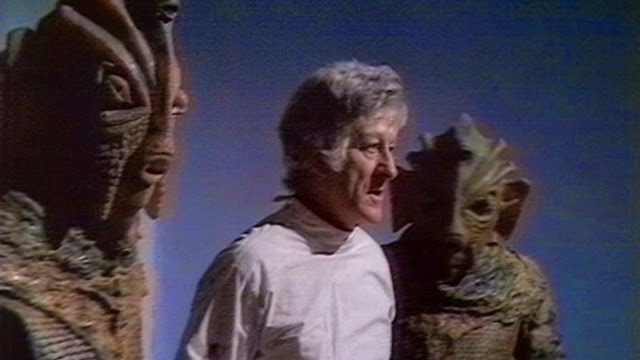 Moving on to The Sea Devils, which shares a few parallels with Doctor Who and the Silurians in that they both deal with prehistoric creatures that existed before mankind, and as the Doctor tells us, to them man is just an ape that got above himself. The inclusion of the Master in prison following the events of the Daemons adds some humor, especially withing the classic swordfight scene. The Sea Devils also gives us the first use of the phrase, “I reversed the polarity of the neutron flow” to which the Master replies, “You what?”. 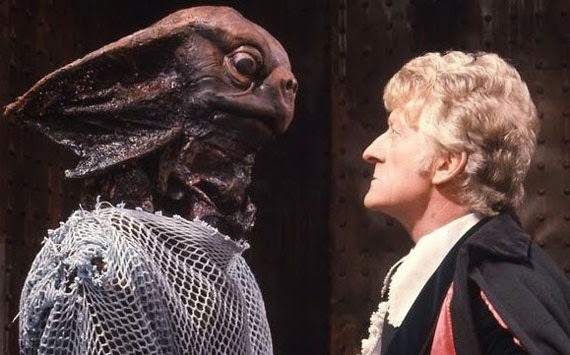 Although the story does drag a little from part four and then slowly picks up again in part six, The Sea Devils is still an engaging and interesting adventure that works well. It would unlikely rank on anyone's list as definitive Pertwee story, but it does stand out as a sound representative of the Third Doctor's typical story structure and pace. The Claws of Axos also features the Master, as well as introducing one of Doctor Who’s coolest one-off monsters, they would be the Axons. The Axons first appear as these beautiful golden creatures, but later when their plan advances and they must begin their attack, they take on quite a different form. The Claws of Axos showcases a different side to the Doctor, one who would do anything to escape his Earth-bound exile, even joining forces with the Master. The Axons themselves are quite creepy, and while they may look like men in rubber suits, they work well due to the presence of Chin as another great villain for the Doctor to fight. The Third Doctor's era found a very strong format, and as a result even the poorest of stories from Pertwee's time are fairly enjoyable. So it becomes harder to single any out here, but let's go with The Mutants. The biggest problem with this story is the issue of padding in parts three through five. A heavily edited 4 part adventure would've made this one far more enjoyable. The concept for The Mutants is hugely interesting, with Bob Baker and Dave Martin apparently basing their story on South Africa and the segregationist policy of Apartheid. We get some decent cliffhangers but many of the performances are uneven, and feeling overly long this really drags the quality down. My least favourite story of the Pertwee era is The Time Monster. Not because it's overly bad, but because, just like the Mutants, it is spoiled by too much padding. The Time Monster does start out strong, with a great set-up in the opening episodes, but it drags from about halfway through before the heavy inclusion of the Atlantis subplot saves the day. It features Roger Delgado's penultimate turn as the Master, and the script itself does an excellent job of using him and the charm that Delgado brought to the part, his manipulation of both Ruth and Galleia is superbly done and stays within the character. Surprisingly Doctor Who rarely does stories that actually deal with time travel and things of that nature, and so here, even in a story with excessive padding and a few uneven performance, it's still an interesting one to watch. Overall the Jon Pertwee era dealt superbly with the Third Doctor's exile to Earth, and provided us with many fantastic stories. 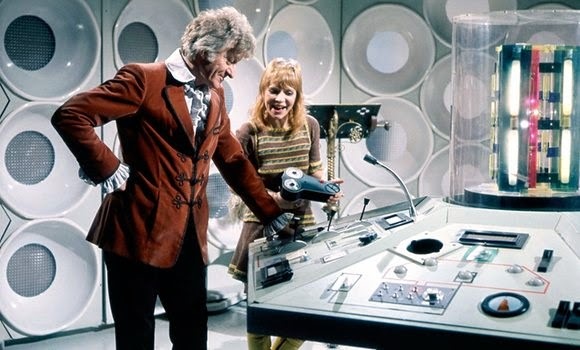 Pertwee's portrayal of the Doctor is more James Bond-like than any other Doctor has been, especially in his use of Venusian Aikido, but he retains the respect that the first Doctor demanded from those around him. His relationship with the Brigadier is legendary and Pertwee's influence can still be seen today in the Twelfth Doctor, and not just in his choice of attire!